A quiet village at 1 / 4h from ANNECY, 1 / 2h from LA CLUSAZ, LE GRAND BORNAND, MANIGOD, the major stations of ARAVIS. 10 minutes from LAKE ANNECY: MENTHON SAINT BERNARD, TALLOIRES, VEYRIER LAKE. Visits to CHAMONIX, GENEVA, YVOIRE and LEMAN during the day. In our Savoy style house, fully independent level, direct outside access by the courtyard terrace reserved cottage. In a hamlet, quiet, the countryside in the mountains, between Annecy and Thônes. Alex in a natural setting, with a village of rural character, original and authentic center making it a quality environment. ACCORDING TO THE SEASON: cultural and historical sites, Cinema in Thônes and Annecy, Bonlieu Theater (National Scene) in Annecy, Old Town in Annecy, the Château de Menthon Saint-Bernard, the Museum of the Resistance and the Necropolis of Glières in Morette Thônes, Food and regional products. All services and shops in Thônes 8 km. Local shops in Menthon St Bernard and Veyrier Lake 8 km. Living room 16 m2 with sofa bed (2 persons), TV, BLURAY player and DVD. Equipped kitchen 16 m2 with dishwasher, multifunction oven, Senseo type soft pod coffee machine, raclette appliances and fondue kit. Courtyard, a small charcoal barbecue, garden furniture, sun lounger. Sheets, towels, tea towels included in the price. Large bathroom (8 m²) with washing machine available. Very very pretty and rustic. Was the lovely ground floor area of a larger chalet, with the owners living upstairs. 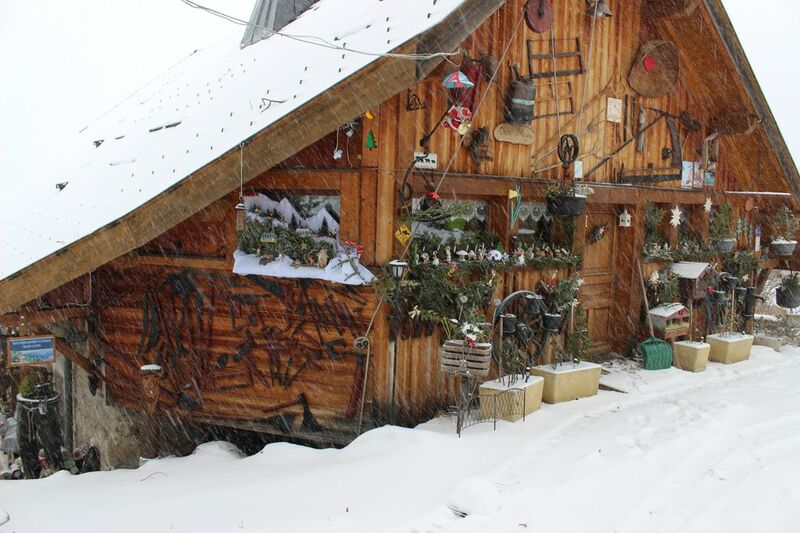 The chalet is located near the top of a small village on a winding country lane, so be aware, if you are coming in the winter you may find this challenging to get up! But it was beautifully peaceful and at the start of a walk either down to get a lovely glimpse of Lake Annecy or up (which we didn't try) towards the rough peak standing above you. It is an easy and quick drive down to Lake Annecy, but a little further if you want to get into the old part of the city. The nearest pubs/restaurants/super markets are in Thones, which is 6 miles away, but seems very quiet in the evening. Everyone we met away from Annecy itself (which seems a little snooty) was very kind and friendly. If you want to explore the alpine centres of the Chamonix and Courchevel valleys are just over an hour away in different directions. The chalet has everything you would expect, but note there is no oven (other than a microwave) and you cannot use the log burner that you see in the pictures. Also mind your head if you are over 5'8"!!! The bed was double but the mattress was VERY soft and would benefit from being changed. All in all a lovely place, and absolutely perfect for a break away from everything. I suspect we were very lucky in having clear blue skies for our entire visit and it may not have been quite so lovely in the cloud. Un séjour agréable , au mois de mai. Gîte agréable et fonctionnel, rien ne manque, très "cosy". La météo n'était pas au rendez-vous , mais nous avons néanmoins passé une bonne semaine dans ce gîte au calme et avec une vue magnifique. Merci à Claudine et Didier de leur accueil chaleureux et sympathique. Merci, pour votre appréciation. Nous aurons le plus grand plaisir à vous recevoir à nouveau. Mais aucun engagement pour ... la météo. We stayed here for skiing in La Clusaz. It is not a huge house, but we were comfortable and happy (2 adults and 3 children). The drive up the mountain for skiing is an easy half hour. La Clusaz was good for skiing with young children who are learning. If you are using it as a skiing base you need to leave early in the morning otherwise the roads become very congested and parking in the first car park becomes difficult. Our hosts were very accommodating and the house was very comfortable. Annecy is also very accessible from here. Chalet agréable et bien situé ,nous avons passé un excellent séjour! Huisje is van alle gemakken voorzien en ziet er goed verzorgd uit. Eigenaren erg vriendelijk en behulpzaam. ALL TOURIST ACTIVITIES OF LAKE AND MOUNTAIN - SUMMER AND WINTER.